BM Ross and Associates Ltd. Redesigned 16 processes that touch the Organisational Structure data residing within two systems to ensure accurate data is captured once, eliminating the need for double-capturing and streamlining paper forms. Lead all change management aspects; including planning, communication, training, updating various policies & procedures, as well as transition back to the line. Redesigned the recruitment process, reducing the approvals required by 50%, activity steps by 32% and throughput time by 25%. Responsible for all change management aspects, including: change impact description, communication, training, job aids, web-site updates, policies & procedure updates, risk& readiness assessment, scope change log, transition back to line. Redesigned several business processes as part of a company-wide system implementation, facilitating risk assessments, gap analysis and risk & readiness assessments for implementation. 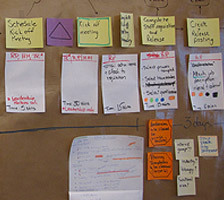 Managed all aspects of the development of a communications video of one of the implementations. Oversaw the transition of projects to the new line owners. 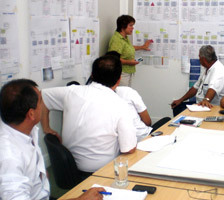 Developed and implemented a workshop introducing management to Lean within the Volvo framework. Developed a Lego ‘Road Grader factory’ to introduce Lean concepts. 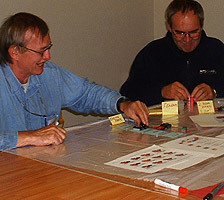 This game was integrated into the Lean certification program for Volvo employees. Redesigned and documented commercial rail processes and tools. Created a railcar management tool for CDN and CEAR (Malawi rail) to manage shared railcar fleet. Developed future state commercial process and compiled detailed specifications document for system development. 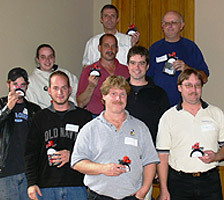 Designed and project managed the First and Second Annual Huron Manufacturing Excellence Awards. 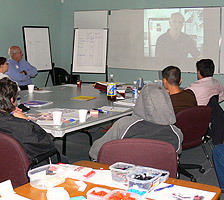 Designed and facilitated Kaizen, Waste Free Manufacturing and 5S workshops and training throughout Huron County. To deliver a service that will have a positive impact on the organizations we consult to. We do this by assisting our customers achieve their operational and strategic goals through holistic solutions which are delivered with the highest levels of professionalism and experience. For a presentation on our approach, click here. The Certified Management Consultant (CMC) designation that Lianti has is a competency-based designation that requires education, experience, and evaluation. The CMC is peer-reviewed by senior practitioners to help ensure a solid understanding and demonstration of the common body of knowledge, combined with strict adherence to the uniform code of professional conduct. Click here for more info. Huron Solutions support Impact Zambia through International Teams Canada. Lianti is the Canadian Program Champion for Impact Zambia. 2017 will see continued work on phase 1 of the training centre with overnight facilities in rural southwestern Zambia. This centre will provide opportunities to local community members to gain vocational skills and knowledge as well as equipping church leaders from rural areas. It will allow the expansion of the Share Your Knowledge project that has been launched on a small scale. Click here for more info.